She’s growing up! Yup, McKinley has made the transfer from her crib to a toddler bed! I’m so proud of my little Kinleybug! She is handling the changes of growing up like a champ. Mama on the other hand? Not so much. Usually, parents do this toddler bed switcharoo in preparation for baby #2…but for the record, no, that was not our reasoning. Other reasons parents switch to toddler beds: safety reasons. 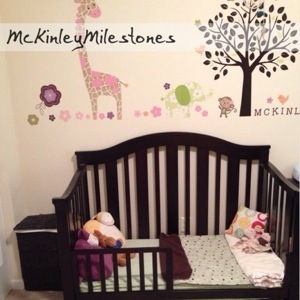 For example, McKinley attempting to climb out of the crib. So that’s why. She probably could have stayed in her crib for awhile longer, but honestly I thought she would love the idea of being able to crawl into her own bed by herself. She has slept 4 straight nights without waking and is still waiting for us to come into her room before climbing out. So precious! Next Post Adventure Walk- Craft Outcome!